The National Emergency Management Agency (NEMA) has distributed relief assistance to persons affected by the recent crisis between the Mambilla ethnic groups and Fulani of the area in Sardauna Local Government Area of Taraba State. 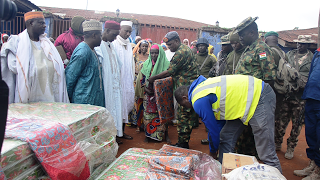 Flagging off the relief distribution in Mbamnga, a mountain top community in the local government area, the Director Search and Rescue of NEMA, Air Commodore Sonny Paul Ohemu said the items were distributed to ameliorate the plights of the affected persons. He said that the distribution was in compliance with the directive of the Acting President Professor Yemi Osinbajo, as NEMA carried out a rapid assessment by identifying the immediate needs and locations of the displaced persons in providing them with the relief assistance. Air Commodore Ohemu who led the NEMA team on the relief distribution to many centres and locations, was also at the Palace of the Tabon Mambilla Dr Shehu Bajo where he presented the assistance for the displaced persons living there and urged the royal father to promote dialogue among the communities to forestall reoccurrence of the crisis. He urged the people to live together in peace and eschew violence. Responding, the Tabon Mambilla Dr Bajo appreciated the Federal Government for the prompt response in the delivery of the relief assistance and the deployment of security operatives in quelling the crisis and restoring peace to the area. Also speaking, the Sarkin Fulani of Mambilla Plateau Alhaji Saidu Bawa thanked the Federal Government for the relief assistance through NEMA and requested for more supports for the reconstruction of houses that were destroyed as well as measures for restoration of permanent peace in the area. He said about 12,421 persons of Fulani extraction that are indigenes of the Local Government were displaced by the crisis, adding that some of them have even crossed over the border into the neighbouring Republic of Cameroon where they are now taking refuge. The Mbamnga Fulani community leader Ardo Ibrahim Jibo who received the relief items delivered to the town on behalf of his people also appreciated the NEMA Director Air Commodore Ohemu and his team for the efforts made in conveying the items to the community through the difficult mountainous terrains and crossing rivers. The relief materials delivered by NEMA consisted of 33 assorted food and non-food items that include bags of rice, millets, cloths, blankets, mattresses, cooking materials, children wears, dignity kits for lactating mothers and detergents among others.